Decker is the name of the ones who break into corporate mainframes to perform missions from rival companies. In this tile-based cyberpunk RL, you are one of the deckers, running in cyberspace to earn skill and money to upgrade your equipment. The player takes on the role of a hacker who wants to earn reputation and money. To achieve this, a decker signs contracts and enters computers systems to fulfill the current mission. Objectives include disabling security devices, crashing systems, retrieval and/or deletion of data, creation of backdoors and many more. For completing a contract, the player is awarded with reputation and money. Any valuable files downloaded while in cyberspace are sold and also added to credits. On the other hand, reputation may suffer if many missions are failed. 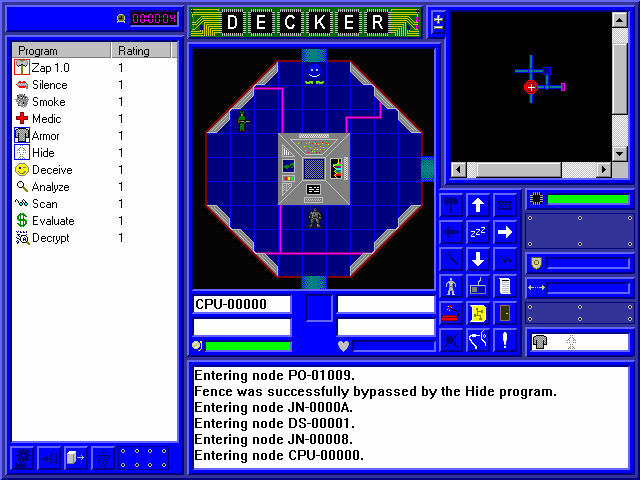 In cyberspace, the player may hack into databases, fight various ICE (Intrusion Countermeasure programs), collect information, and several more activities. Sometimes source code is found and upon downloading can prove to be a valuable tool for the hacker to use. Gained money may be used to upgrade hardware, pay for treatment, new software and rental payment. The game is divided into two contexts: inside the Matrix, when the player is invading systems, jacked to his cyberdeck; and in the real world, where you manage the character's life: from choosing jobs (or waiting for new ones) to developing new software, hardware, resting, shopping and paying the rent. Defunct official website, went down on 2013. Decker SourceForge page which contains source code for different game versions, a Pocket PC port and an early-stage Java port. CyberDeck, port of the game to XBox. This page was last modified on 10 November 2018, at 19:07. This page has been accessed 46,643 times.